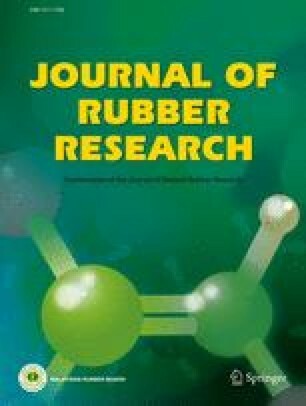 The variability of natural rubber (NR) properties has been partly ascribed to the 3 to 5% non-isoprene components (lipids, proteins, carbohydrates and minerals) present in NR. Of all the factors that might be held responsible for this variability, clonal origin has appeared to be prominent. The sugars and polyols of latex from five Hevea brasiliensis clones (RRIM600, GT1, PB235, PB260 and PB217) were extracted with ethanol after specific NR sample pretreatment in a cyclohexane/ethanol solution. Latex carbohydrates were characterised by high performance anion-exchange chromatography equipped with a pulsed amperometric detector (HPAE-PAD). Total extractable carbohydrates, single sugars and polyols were analysed for each clone to evaluate how clonal origin affected the variability of latex carbohydrate compositions. Significant clonal differences were identified, both in the total sugar and polyol contents of the latex, and in the quantity of each element. The differences between the latex extracts of clones GT1, PB217, PB260, PB235 and RRIM600 did not come solely from the presence of major carbohydrates, such as quebrachitol or sucrose, but also effectively from minor carbohydrates, such as sorbitol or galactose. Some minor carbohydrates could even be used as biochemical clone indicators.